Its healing properties have been confirmed by more than 4,000 scientific studies. Moreover, thousands of published, peer-reviewed studies conducted and compiled have also shown that it can be as effective ( or even more) as at least 14 pharmaceutical drugs currently on the market. Anti-inflammatory: The journal Oncogene published a study which found that curcumin is an effective alternative to the drugs aspirin, ibuprofen, naproxen, indomethacin, diclofenac, dexamethasone, celecoxib, sulindac, phenylbutazone, and tamoxifen in showing anti-inflammatory and anti-proliferative properties against tumor cells. Drugs for cholesterol: The journal Drugs in R & D published a 2008 study which found that a standardized preparation of curcuminoids from Turmeric can provide the same effects as the drug atorvastatin, on endothelial dysfunction, the underlying pathology of the blood vessels that causes atherosclerosis, and fights inflammation and oxidative stress in the case of type 2 diabetes. Metformin (diabetes drug): The journal Biochemistry and Biophysical Research Community published a 2009 study which found that curcumin activates AMPK (which increases glucose uptake) and suppresses gluconeogenic gene expression in hepatoma cells. Researchers actually found that it is 500 times to 100,000 times more potent than metformin in activating AMPK and acetyl-CoA carboxylase (ACC). Corticosteroid drugs: The journal Phytotherapy Research published a 1999 study which showed that curcumin compared favorably to steroids in the treatment of chronic anterior uveitis, an inflammatory eye disease. Moreover, it has also been found to be as effective as the corticosteroid drug dexamethasone as an alternative therapy for protecting lung transplantation-associated injury by down-regulating inflammatory genes, and as dexamethasone in a lung ischemia-repurfusion injury model. Blood thinner drugs: A 1986 in vitro and ex vivo study showed that curcumin has potent antiplatelet and prostacyclin modulating effects which can be compared to the ones of aspirin. A chemotherapy drug: A 2007 study published in the International Journal of Cancer showed that curcumin is a safe alternative to oxaliplatin as an antiproliferative agent in colorectal cell lines. 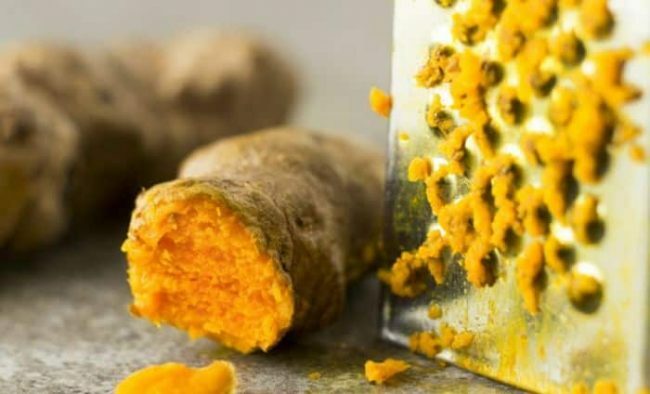 Alzheimer’s Disease or dementia: Annals of Indian Academy of Neurology published a study which found that the intake of one-quarter of a teaspoon of turmeric extract or powder daily can improve the symptoms of Alzheimer’s and dementia. The authors of the study claim that: “a growing body of evidence indicates that oxidative stress, free radicals, beta-amyloid, cerebral deregulation caused by bio-metal toxicity and abnormal inflammatory reactions contribute to the key event in Alzheimer’s disease pathology. Due to various effects of curcumin, such as decreased Beta-amyloid plaques, delayed degradation of neurons, metal-chelation, anti-inflammatory, antioxidant and decreased microglia formation, the overall memory in patients with AD has improved”. Antidepressants: A study conducted in 2011 found that curcumin can provide the same effects as both these drugs used for depressive behavior in an animal model. What’s more, it does not cause any of their side-effects.